There are so many different kinds of foundation brushes out there, and sometimes it’s hard to tell which will work best with your different foundations, and which are worth splurging on. I’m in no way a makeup brush expert, but through some trial and error I have developed some opinions that I think might help anyone who’s in the market for something new but isn’t sure where to start. I absolutely love using a flat top brush with liquid foundations because they give great coverage and erase any streaks or harsh lines. You can use these with powder or cream foundations as well, but I’ve found that you don’t have as much control over the coverage when using those textures with these brushes. These brushes are used for buffing out foundation for an even coverage. I like to tap the product onto my skin with the brush before buffing it to get a more smooth application. Or, I apply my foundation with my fingers and apply my setting powder with one of these to smooth it all out. It can be difficult to reach certain areas around the nose and under the eyes, but that hasn’t been a big enough problem for me to NOT be completely in love with both of these brushes. If you’re going to splurge on only one type of foundation brush, I think a buffing brush like this would be the one to choose. A cheap version is good to start out with as you’re learning (and to make sure you want to invest in a better one), but you really risk fallout with this type of brush because of the quick, circular motions you use with it, and with cleaning such a dense brush. I think it’s definitely worth the money to find a quality buffing brush if you see yourself using it as a staple. These brushes work really well with cream or mousse foundations, because their flat shape and sturdier bristles allow you to spread thick makeup very easily. These are great with liquid foundations as well, just less efficient than your other options, in my opinion. I call these my “painter” brushes because I feel like I’m painting when I’m using them—it makes putting on foundation fun! This brush is perfect for spreading foundation over large areas as well as getting into tight corners around your nose and eyes. And, it’s easy to build coverage with it because of its precision. 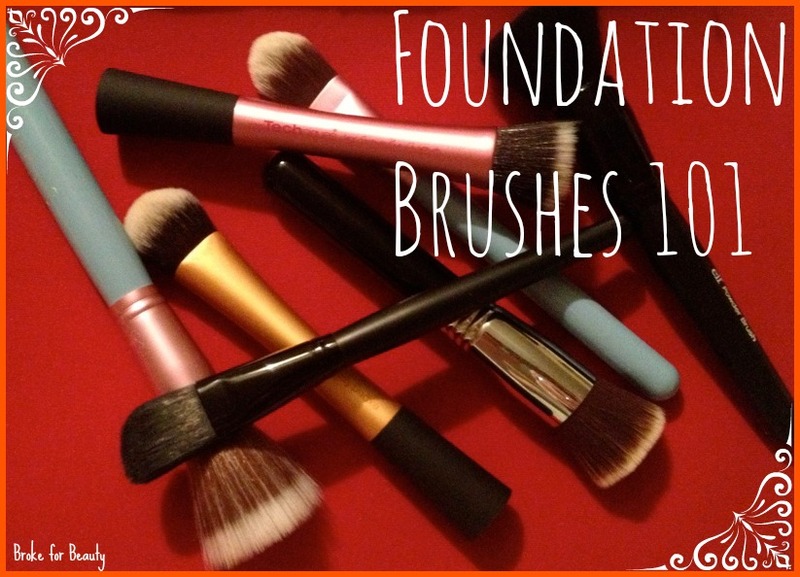 There are a ton of options for a flat foundation brush out there. My Sigma one is super sturdy and easy to clean, but you probably don’t have to spend so much on this type of brush. Conversely, the ELF version is probably too cheap. I accidentally loosened the top of the brush as I was cleaning it, and since it’s used for liquid makeup, it’s SO important to be able to work the soap into it to take care of any forming bacteria. There’s probably some magical flat foundation brush in between these two price points, so if you know of one, let us all know in the comments! I wasn’t sure what to call this “category” of foundation brush because I don’t know of any other foundation brushes of this type. I heard about this brush from a few different YouTubers and decided that I had to try it out. I find that this brush works best with lighter foundations and BB creams. Anything too heavy can look streaky when using this brush. But what I love about it is that it seems like a mix between a buffing brush and painter brush! The bristles are very densely packed but soft, so it really does a great job buffing in makeup with precision. Like I said, I don’t know of any similar brushes to this one, but luckily this isn’t too expensive! You can find it at Ulta, and I happened to find it in stock AND there was a BOGO half off sale on this brand. Score! Honestly, I don’t usually use these with foundations, so if I’m totally off the mark in my description here, let me know. I’ve heard these are wonderful with powder foundations and setting powders, as well as creams. I use the Real Techniques (smaller) one with cream blush, and it’s perfect for that! Small stippling brushes are great for cream or liquid highlights, too. The Sigma one is really too big for me to get much use out of. I’ve used it with powders before but I think I need to try it with a loose powder, either a foundation or setting powder. It has some trouble with pressed powders because of the soft bristles. ELF has a small stippling brush that I’ve heard works well, and I don’t think its fragility would be as big of a problem with this type of brush as it is with the painter brush. Depending on how much you would use a stippling brush, you don’t need to spend a lot of money on one, I think. I totally threw this in last minute because it’s not really a brush, but the Beauty Blender is huge in the beauty community right now and I think it deserves representation in this Spotlight. I like how this makes my makeup look, and it’s fun to use, but my current opinion is that it’s more trouble than it’s worth. For one, I’m usually just too lazy to use it. The fact that I have to wet the sponge and put the foundation on my hand to dip it in seems to add so much time to my morning, even if it really doesn’t. I also struggle with getting the right amount of dampness with it. I’ve tried getting the whole sponge wet and squeezing it dry in a towel as I’ve seen other bloggers/vloggers do it, but it watered down my foundation more than I expected. I tried just dabbing some water onto it, but then I was confined to just that one spot. Also, it stains, so it looks pretty gross. I’m going to keep using this, and I’m sure I’ll completely change my mind and fall in love with it. I think if you’re going to get a sponge and think you’ll use it enough, you should definitely pay out for the real thing. Imitation Beauty Blenders are not nearly as soft and springy as this one. That’s the end of my first Sunday Spotlight! I hope that those of you looking for a new foundation brush have a better sense of what to buy and whether or not it’s worth a splurge. I’d love to know if this series is helpful. What are some of your favorite foundation brushes? And what else would you like to see for a Sunday Spotlight? Love my real techniques brush, it’s a must in my make-up bag! Same here! The only thing that annoys me about it is that it gets thicker at the bottom, so I can’t fit it in my brush holders with the others. But the brush is so great I can’t complain! Yes, that’s true! It’s amazing at buffing out lines, but I think my issue came from being so used to using a flat top brush that covers more surface area. I’m probably just too lazy 😛 It’s an amazing and versatile brush! I looooove Soho’s foundation “painter” brush. It’s double-ended, and comes with one side for your foundation, and the other side for concealer. It’s my favorite of ALL TIME to apply my liquid foundations with. This was a very informative post, and I’m happy I stumbled upon your blog! That sounds like an awesome brush! I’m definitely going to check it out. I’m glad you enjoyed this post – love your blog too! Oh thank you! And I apologize, but I made a mistake. The brush is by POSH. I’m glad it helped! I got mine at Sephora in the “impulse buys” section by the checkout. You can also order online from a number of places. Love your blog! I love the Real Techniques brushes! 😀 I never thought of them as a mix between a painter brush and a makeup brush, but it definitely describes them pretty accurately. I have the e.l.f. stippling brush and, it works pretty well. E.l.f. brushes are pretty good for their value. lol. Still, a clean brush is better than a dirty brush! So glad I found your blog, I love it! And great post by the way. 🙂 I was thinking about getting a Beauty Blender but after reading your opinion, I think I can live without it. It really does sound like a hassle! Thank you, glad to help! I think a Beauty Blender is good to have because it does make foundation look really good, but it’s good to go into it knowing that it might be a hassle. Like, it’s not an every day must have for me but I’m glad I have it.